While trimming brussels sprouts for roasting last week I had a thought. These little gems are mini cabbages and I wondered if roasting a giant cabbage would be just as delicious. I have eaten cabbage steamed, stewed, sautéed, braised, pickled in brine, and even raw in slaws, but never roasted. And without a doubt adding a few bacon lardons would be delicious. Indeed. 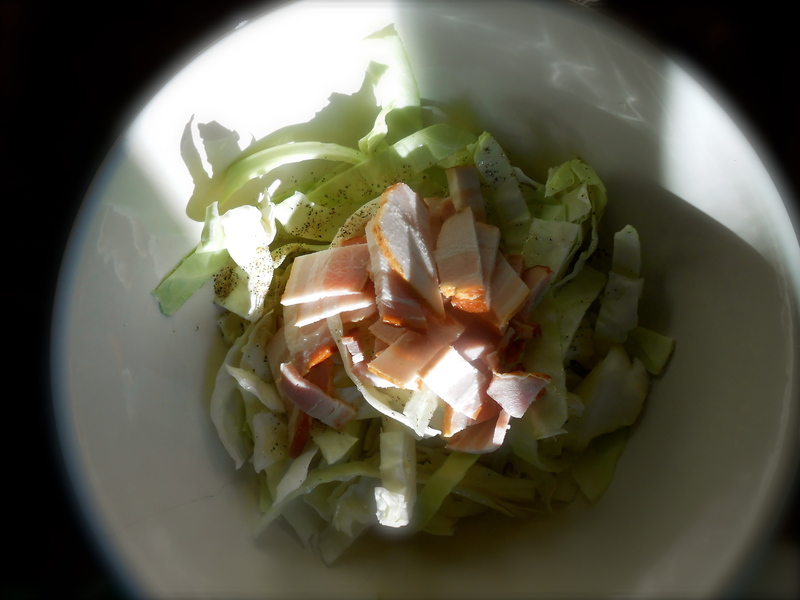 The texture of the cabbage was soft and the bacon crunchy. The combination of the roasted bacon and the sweetness of the cabbage was truly one of the best things I tasted in quite some time. I could not quit eating the crispy charred bits of cabbage before bringing it to the table. Served with parmesan chicken cutlets. Recipe coming…next post. Preheat oven 450°F. Put all ingredients in a large bowl and toss until well coated. Spread evenly onto a large parchment lined baking tray. Roast for 30 – 40 minutes turning regularly using a spatula, until well roasted and bacon is crisp, yet still meaty. Sounds quite simple and delicious! Can’t wait to try this. Thank you Ngan. Hope you do try it out…it’s so easily put together and the outcome is so warm and delicious. ;) Seriously….the charred pieces were my favorite part! I have always been so fond of cabbage and now I like it even more. I’m thinking of slicing it even thinner next time…somewhat like a cole slaw and then roast it. Good lateral thinking! Looks really delicious. Thank you! :) I sure like your gravatar photo! I nver tried roasting cabbage but all other vegetables taste so good roastes, so why not cabbage. That’s exactly what I thought. Roasting vegetables are such a great hands free way to cook up a side dish. I’m really using the oven lately! It’s been freezing here for the past seven days or so, having the oven on is very nice in the kitchen! Looks great. The bacon is a genius addition! How you make time to take such spectacular photos of beautifully prepared and good tasting meals while working outside the home is beyond me but I’m sure glad you do! Thanks as always. Karen, thank you so much for your kind comment. Thank goodness my work schedule is so that I ‘m home by 3.30 in the afternoon. Gives me time to get dinner on the table at a decent time. :) Nice to hear from you! Your post came at just the right time. I have five heads of cabbage (from my CSA) in my fridge right now. I’ll pick up some bacon at the store this week and give it a go. Thanks! Oh good! Five cabbages! Wow. I love cabbage and would be so happy upon looking in the CSA box. Hope you use some of it and try roasting. It’s wonderful. I was thinking next time I prepare this to slice the cabbage a little thinner and get it a bit more crispy around the edges. Let me know how it turns out! Like you, I’ve exhausted every cabbage cooking method known to man/lady. Have never thought of roasting it though! Excellent idea, and really beautiful description! I can almost taste it. I adore cabbage and my favorite has always been cole slaw and sauerkraut. But now I’m loving it roasted. Seriously easy to put together allowing more time for the cutlets! Did you make with your pasta? Let me know if so because I would love to know how it went! I’ll post it soon with a link to your blog. Great! Great! So glad to hear it and I am really looking forward to seeing your post. I never imagined this with pasta so I’m especially interested! Great idea! I must try chorizo with brussels sprouts. I put it was fabulous. Especially love the idea of adding spiciness to them. And I do adore chorizo and haven’t had it in years. Thank you for the idea! cracking me up here as my kids (and possibly my husband, haha) would not vote me “nicest person in the world.” I do hear the word “sweet” a lot from colleagues and friends, but there are also other adjectives I hear ;-) Appreciate your kind words more than you’ll ever know! Great idea. Lovely photos too. Thank you, and most likely you have prepared this numerous times…apparently this is very Irish? Yes and no. I have never baked the cabbage. This I must try. i think we are on the same page on this one. sometimes i do this exact same thing with nappa cabbage or bokchoi. nappa tends to have a tighter leaf structure, so you get even more burny bits (which i agree are the best part). it is strange and funny how sometimes we make very similar dishes, but they end up different because of the availability of local ingredients. i’ve started to really enjoy it. How could it be? We have similar palate’s 5000 miles apart! Hey, I saw black garlic at the market the other day. It was fermented. The package said it was a Japanese delicacy. Is it true? I didn’t buy it I thought I would consult with you first! After I prepared this I thought I would try it again with either savoy or nappa cabbage. I like burny bits too! It’s such an Irish thing, cabbage and bacon. Or at least it used to be. Slow cooked it’s called black cabbage, due to the charred edges I suppose. It’s always slow cooked on the hob/stove for at least an hour. So sweet and tender. Just a little butter and/or bacon fat. It’s only the Savoy cabbage that’s used as far as I know. So, so good with eggs, bacon and mash. I did not know this is an Irish thing! Interesting. I imagine and agree this would be good with eggs and mash. I have slowly braised purple (or red) cabbage and yet never added bacon to it. Although perhaps braised would leave the bacon soft rather than crispy. Black cabbage, I’m going to look it up! That’s a capital idea! Roasting is always a good choice, isn’t it? I’ve cooked cabbage with bacon on the stove top countless times. Roasting them never occurred to me. Well, that’s about to come to an end. Thanks for sharing a great way of to cook cabbage. That sounds delicious …nice idea. Inspired as usual! Great idea! Adding bacon to cabbage is the only way I can get it eaten in my house. They are a perfect match. First time I have made bacon with cabbage and it is fabulous. I love it. I couldn’t stop eating it and actually, this was all I needed for dinner. Great! Sounds good with pasta and garlic. Nice work Sophie! I love unusual treatments of Brussels sprouts, so this makes sense to me. What an interesting idea! Yum. You know I love roasted Brussels sprouts!! :) The charred bits are my favorite part too. Love them with bacon — great recipe, thanks for posting! Yes, you and I have this in common. :) The cabbage was a nice change and I really liked the sweetness of it. Yum! This sounds really tasty! I love the idea of roasting the cabbage with the bacon – it’s innovative and sensible all at once. And I can imagine the flavour. Lovely! YuM! I’ve never tried roasting cabbage and bacon — wow! I’ve only sauteed it! Oh, snap. Throw in some apple slices and a few bratwursts and you have a traditional German-American dinner. 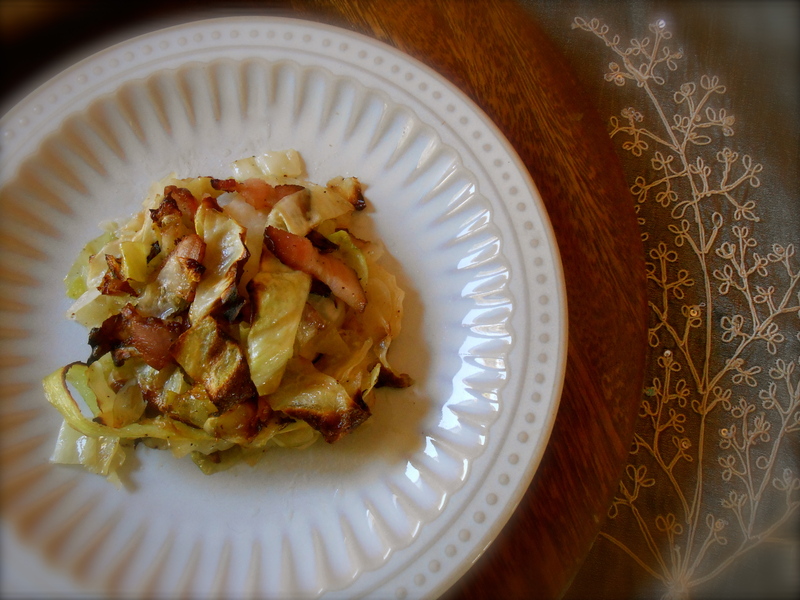 You are currently reading roasted cabbage with bacon at COTTAGE GROVE HOUSE.